Gorogoa is one of those wonderful, must-play games that just may have slipped past my radar if not for strong word of mouth. While I love puzzle games, I haven’t been keeping up these days, especially since much of the genre transitioned to mobile. I also wasn’t expecting to review any more games before the year’s end but with the persistent recommendations of the social media grapevine, Gorogoa has been hard to ignore. What could possibly be so special about this game that my colleagues, nearing the end of a long release season, would devote so much attention to it right before Christmas? Could it possibly be that good? Without having seen a single screenshot or even read a press release, I grabbed a Steam review code and blindly dove in with both feet. At a glance, it’s easy to see why the game became so quickly popular. Its visual style makes a strong first impression. Heavily influenced by the early and middle period art and architecture of the Byzantine empire, it features many of the expressions that came to define the era, from daintily etched relief carvings, to richly detailed pottery and vessels, to grand domed buildings with symmetrical spires soaring into the sky. It is a period that is rarely explored in contemporary mediums, especially videogames. For that alone, Gorogoa is remarkable. A large portion of Gorogoa’s charm, however, shows up in the formatting. As I played, I couldn’t help but marvel at its innovative use of space. 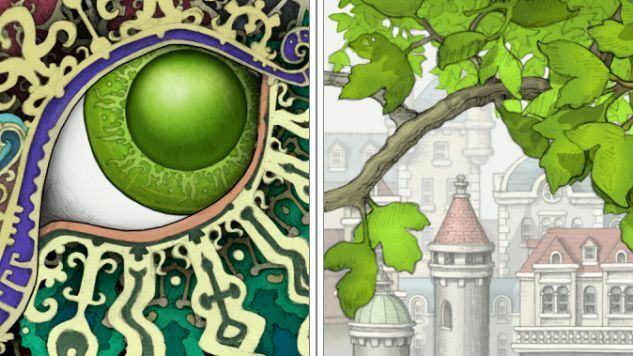 The game’s sole developer and illustrator, Jason Roberts first conceptualized Gorogoa as a card game but later scrapped it because the mechanics were too complex. Fittingly, the simplicity of Gorogoa, with its lack of subtitles or voice acting, limited animations, and minimal use of audio, suits it well. On the screen are four panels presenting environment-based interactive puzzles that, once deciphered, will progress the story. The pictures shift and can be aligned in sequence to match up key atmospheric details, pulling off layers and overlapping others to reveal solutions and clues as the player explores and combines elements of each. Think of it as a picture book where the reader must solve a mystery hidden in the illustrations to turn each page. While that description makes the process sound laborious, it’s anything but. I’m in awe of the puzzles of Gorogoa. They, and by extension the game, offer almost no impression as to where they will go next, and yet they leave a satisfying sense of accomplishment even when the solution is found only through trial and error. There’s almost a surreal relationship that the game’s objects maintain between obstacle and solution, one that is often obtuse and mysterious, yet for all the barriers it presents to the narrative progression, the confusion does not seem cheap or limiting. Instead, the pacing is well balanced with an appeasing flow that seems to anticipate the player’s tentative curiosity and success rate. While occasionally I was stumped, I was never put off, which is a tremendous achievement. I suspect the developer has played a lot of mobile games, because as mystifying as the game’s challenges can be, the intuitive controls always reflect thoughtful touch-screen design sensibilities. Gorogoa is a quick play, which is disappointing but also a relief. The narrative, which seems to tell the story of a young boy collecting fruit to offer a beautiful dragon-god, is far too elusive for the player’s patience to hold out for long. And some things are meant to be enjoyed in small bites. Tread too many times, even the most interesting premises can wear thin. The novelty of Gorogoa would probably seem less magical if there were more of it. I didn’t expect to make room in my heart for one more game this year, but Gorogoa was worth the effort. As a palette cleanser rounding out my year in games, Gorogoa is the perfect snack. Gorogoa was developed by Jason Roberts and published by Annapurna Interactive. Our review is based on the PC version. It is also available for iOS and the Switch.